Certain encounters in our lives are truly timeless – a ‘time’ when we become blissfully unaware of time. However, while it is not uncommon for someone to lose track of time, this by itself does not constitute a mystical experience of timelessness; in fact this would not even challenge our conceptual understanding of space and time. Timelessness is, in simple terms, a mystical experience that transcends time. Such mystical experiences make us feel and believe that time and space are illusory. The mystic finds himself in a dimension where time does not exist; he is always in the ‘now’. Mystics speak of three types of knowledge: sensible, rational and a third kind described as an exalted power of the soul - a power so high and noble that it enables one to come ‘face to face’ with God. This power knows no yesterday or tomorrow, for in eternity there is only the present. Kahlil Gibran very aptly said, ‘The timeless in you is aware of life’s timelessness. And knows that yesterday is but today’s memory and tomorrow is today’s dream’. The feature of time that we are most familiar with is that of it passing, flowing by us - whether we are willing to have it do so or not. We are born, we grow, we live, we learn from living and eventually we die. 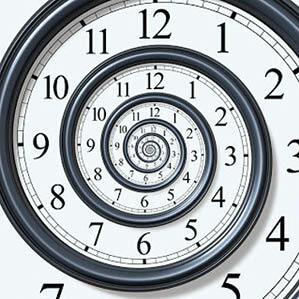 This aspect of time’s flow is so deeply ingrained in our perception that it is not even questioned. It is taken for granted. Yet, the possibility of living in a timeless manner is a capacity that each of us has, which emerges when our embeddedness within physical reality diminishes and our connection with God and the eternal increases. Such a shift involves a relocation of identity to the present, freed of past connections and future plans. This relocation roots our identity to the source of our being, rather than to the reflective feedback of others or to the content of external events. As we move towards the foundation of our being, our sense of relationship with the present moment becomes the expression of our relationship with God-in-the-present. However, this ‘movement’ can be a challenge for us. We think of ourselves as our parents’ children or our children’s parents, by the work we do, or the work we wish to do. We do not feel comfortable defining ourselves by what is unknown and changing. Living in timelessness involves a profound redefinition of identity - trusting that what is happening now is all there is and all that needs to be. This moment, this ‘now’, has immense significance because its source is in God. It and we are woven together in a dance called ‘life’, and the dance is eternal. By knowing this, we can let go of everything else and live in the moment, trusting that it will take us to the next moment in whatever way it is meant to - in whatever way pure divine intention manifests itself. ‘Our rootedness in God is what makes possible this experience of timelessness, for it is God who is unfolding Himself in a myriad of forms…moment to moment. Understood in this manner, there is nothing that we need to hold onto and there is no need to hold on to anything. Within each moment we can have a significant interaction; each moment can call forth our total engagement. The new identity thus available to us is a fluid one, which includes the perception of timelessness-within-time. We unfold like flowers within the landscape of space and time - budding, blooming, wilting and dying. All the moments of our life occur simultaneously within the landscape of space-time, a landscape that unfolds like a scroll, with all moments and events co-existing within it - though we tend to view these sequentially. It is our attention, focusing now on one aspect of reality, now on another, that allows us to experience the passage of time. Our selective attention concentrates on the details of experiences that it deems important, separating these from all others; and this fluctuating concentration, shaped by the relationship between subjects and objects, is what allows us to experience the passing of time. The scroll of our life unfolds as we selectively view the events of our life, both inner and outer. The relationship of time to our consciousness is complex, and changes as our consciousness evolves, shaped by where we focus our attention and also by how ‘embedded’ we are with our physical senses. With less embeddedness, we discover that the sense of being immersed in the passage of time is not an immutable property of reality. Rather, it is a property of the reality maintained by the perceptual apparatus of our brain and sense organs. As embodied beings, having higher cortical centers and neural pathways, which modulate our five physical senses, we perceive what our physically based perception tells us. As we become less dependent on this way of perceiving and more open to other ways, we are increasingly liberated from what has been our typical way of perceiving time and can experience a new relationship with the present. In this freer perspective, it is not that the past is forgotten; it just becomes part of a lesser reality. With an increasing sense of the eternal infusing the temporal, eventually the present becomes all there is. Our most basic reasons for thinking that time exists are because we seem to clearly perceive its three distinctly different components - the past, present and future. Each of these ‘times’ seems to have a clear and evident nature. And time is the ‘thing’ that encompasses them all, and flows between them. The past seems to be constantly accumulating and receding, as new events naturally become ‘old’ and sink away; these events are still visible in a sense, but are unreachable and unchangeable. The present is here, ‘now’, where things happen, as we travel forwards through time, or as time passes by us. And the future is how we describe the endless stream of new events that just keep happening, sometimes fairly predictably (like a tide coming in or going out), and sometimes completely randomly (even chaotic, like a sudden storm or a lottery) - leading finally, and inevitably, to our demise. There is a method to approaching the transition into timelessness and the eternal. As we move across the landscape that is the unfolding scroll of our life, we can allow the present to become highlighted and everything else to grow dimmer. What is past can form a background for where we are now, but not determine who we are. The fluidity of our consciousness, uprooted from its dependency on the five senses, allows us to have a different relationship with each moment. There may be other significant moments that our memory sustains, but these become living experiences within the present, not parts of the past. They become part of our present ‘live-ness’, which just ‘is’. Thus, moments that occurred ten, twenty or fifty years ago can be equally real if they form part of our present ‘live-ness’. As our consciousness begins to incorporate these moments into our present awareness, we make contact with them across the space in which they coexist with us now - the space that is the parchment scroll of our life. Here, all that is loved or valued is held forever. The scroll of life upon which all events are written is more than a metaphor. It is the cosmic memory or mind of God, which holds all essential features of life within itself. It chronicles our current life, as well as all the lifetimes that we have lived and will live as part of our evolutionary cycle. The scroll is continuously changing, according to our present thoughts, words and deeds. We are forever reshaping both our history and our destiny through our current actions and choices: what we do now, or choose now, affects our life in both directions. Though the fundamental outlines exist, shaped by the essential qualities of our soul and its divine purpose, all aspects of this chronicling - which includes what we call past, present and future - are mutually inter-penetrating, even while we perceive time to be flowing in only one direction. By living more fully in the present, we are more able to feel a connection with our self and our life, and with the deepest purpose of our existence. By embracing the present, by allowing it to be the most important aspect of what is, we give full permission to the Divine to manifest through us, allowing us to fully live our lives from the deepest cores of our essential natures. Do we have a choice as to what is written in the scroll, or is it all written someplace or sometime that we call ‘before’? God knows. (I have been fortunate to have experienced timelessness while pursuing my studies on spiritualism).